Twenty Theatres to See Before You Die by Amber Massie-Blomfield is a love letter to Britain’s theatres — a beautiful paean to the nation’s radical, nonconformist performance spaces, which was published last year by the excellent Penned in the Margins. Below is a passage from the book about the Minack Theatre in St Ives, Cornwall. An implausible tower. Seaspray. Barbed wire. Sorcery. An upturned wheelbarrow. Loved ones lost at sea. On the beach at St Ives, a man is building implausible towers. He chooses the largest stones, great grey seals scattered across the shore, weathered smooth by time and motion, bending his knees beneath the heft of them. Then – with a pace that’s either meditative or agonising depending on your disposition – he balances them on top of each other, moving with his breath to find the smallest contact point, a hair’s width from tipping. My friend Dan and I join the audience that has gathered on the promenade. Together we watch him, momentarily captivated by his feat. We murmur into little ripples of applause after each illogical balancing act, buy a postcard from his wife at the stand nearby. The towers start to grow, beginning an unlikely ascent to the sky. Humans have long been infatuated with towers: the spectacle of them, the reminder of how far, through perseverance, our grasp might stretch. A tower is a symbol of defiance; a manmade disruption to the natural order. In White Sands, Geoff Dyer writes about the Nuestro Pueblo Towers, 17 strange, rocket-like structures that thrust up to 30 metres into the skyline above Watts, Los Angeles. Crafted from cement and wire, and a menagerie of found objects – broken bottles, crockery, tiles, seashells – they were created by Sabato Rodia, an Italian construction worker who laboured alone, tirelessly, over 33 years, to bring this magnificent folly of his own invention into being. Contemplating what it was that led Rodia effectively to give his life to creating the towers, Dyer writes ‘his purpose was perhaps similar to that of people who climb mountains. Maybe the only answer to the question of why Rodia built his monument is a negative version of Hillary’s famous response about why he had climbed Everest: because it wasn’t there’. 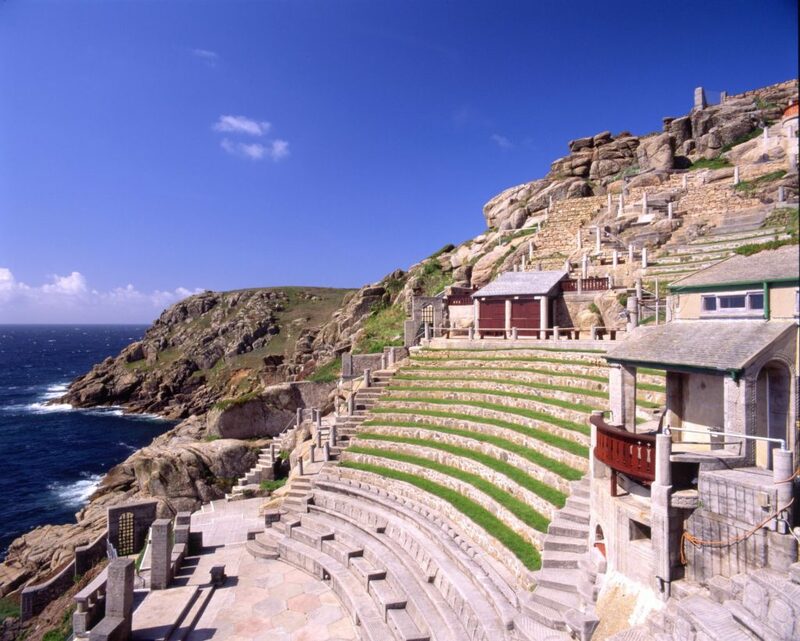 I think of this the next day, standing at the tip of Cornwall, gazing down at the open-air theatre Rowena Cade wrought from the cliff at the farthest reach of the country. The Minack looks like something out of time: an open air amphitheatre from a forgotten past race, so unlikely in its positioning on this southwesterly outcrop of Britain that it must speak of an alien culture. An avalanche of terraced seating falls away down the steep gully, sporadic outbuildings tipping slate rooves forward, as if at any moment they must tumble over, come crashing on to the sharp ridges of granite jutting into the Atlantic far below. Haphazard paths and stairways snake across the steep terrain, bending themselves to the contours of the Cornish land. Great lichen dappled boulders shrug up through the earth. The auditorium is pockmarked with splashes of colour, violent oranges and pinks, tropical flowers and succulents clinging tight to the cliff through the elements. The stage, far below, is an awkward, wide strip of stone, scattered with columns and archways, a raised round dais, a sweeping stairway befitting grand entrances. Beyond it, a strand of bleached sand beach along the coast, and the ocean, cyan spilling into ink, and the great big sky, bright and clear today: a summer holiday sky. It’s the kind of view you come to Cornwall to gaze at and to post on Instagram, a view that’s a little bit too glamorous for Britain. 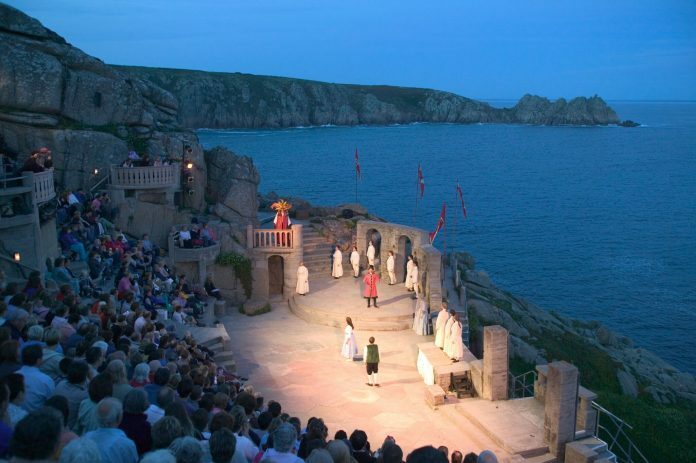 It could easily upstage the theatre, but there is in fact a quite-rightness about the Minack being situated here. In their unlikely meeting, the theatre and this great hunk of unbounded nature amplify one another. Later, I’ll become obsessed with the place’s webcam, returning often to take it in, low res through the rain splattered lens, on smeeching winter mornings with the sea fizzing and angry, or at night, when all I can make out is the faint rough outline of granite, an electric glaze of moon on water. In the early 1930s, Rowena Cade stood here – perhaps on this very spot – looked out at what was then little more than a scrubby, inhospitable patch of cliff, and imagined this theatre. How she realised her remarkable vision through decades of arduous labour and sheer bloody mindedness is for me one of the most inspiring stories of holding a faith in theatre, and a testament to the power of just getting on with it. Rowena, who was born in Derbyshire in 1893 and had spent much of her childhood in Cheltenham, moved to Cornwall with her mother in the 1920s. While living in rented accommodation in Lamorna, six miles up the coast, she discovered the Minack headland overlooking Porthcurno beach and bought it for £100 (which doesn’t sound like much for a headland, but who knows the going rate for headlands?). They built a house on the site and moved here soon after. Rowena became involved with the local amateur dramatics group, and in 1929 designed and made costumes for an open-air production of Midsummer Night’s Dream, performed in meadows nearby, all gauzy fair wings and lopsided pixies’ hats. Elsewhere, the Great Depression was bringing its blunt fist down on the nation, a black and white newspaper print collage of grim faced men with flatcaps and placards, tired children in threadbare clothing. It must have seemed a far cry from this idyllic Cornish outpost, the days spent swimming in the astringent azure sea, conjuring Oberon and Titania in countryside ‘quite over-canopied with luscious woodbine, with sweet musk-roses and eglantine’. But Rowena’s life had been touched by the turbulent, dense history of the early 20th Century. The First World War brought an end to her genteel upbringing, and she found herself in a job breaking horses for the army in Elsenham, living in an old shepherd’s caravan. Her father went away to fight and never returned; her brother was subsequently sectioned, suffering Post Traumatic Stress Disorder. With the family dismantled her mother had sold their home in Cheltenham, and she and Rowena set off on the road, spending what I imagine as a listless year travelling the country, trying to find purchase in a deeply unsettled world. They came to rest here, a place that still feels remote, far removed from the traffic of human life. A lonely place, possibly. In 1931, The Tempest was suggested as the next show the amateur dramatics group would stage; it’s easy to see why these cliffs overlooking the Atlantic so readily suggested themselves as a setting for Shakespeare’s tale of mighty storms, wrecked ships and loved ones lost at sea. That winter, with the help of her gardener, Billy Rawlings, Rowena set to work. They blasted the site and used the granite they extracted to craft the first, green cuticled terraces of seating, the grassy patch of stage. She would bring sand from Porthcurno beach far below, setting off up the precipitous, 90 step stairway that winds up the headland, goat-like with the sack slung over her narrow back. She mixed it into cement, forged it into stairways and rows of hard seating, carved with celtic designs of her own invention. Slowly, through a momentous effort of physical labour, the wild gully began to resolve into a theatre, ready for its first audience on 16 August 1932. The theatre became her life’s work. For more than half a century she kept at it, spending harsh Cornish winters hauling timber and ballast up from the beach, working tirelessly, late into the evenings, often alone. It was an epic undertaking, and her tools were no more sophisticated than a wheelbarrow, a hammer and chisel. She would make improvements ready for the next summer’s shows, adding a throne for Anthony and Cleopatra or a new dressing room. The seating rake began to spread outwards and up, sightlines determined not by design but the contours of the landscape, growing into an auditorium now capable of holding up to 750 people. She’d carve the names of the plays performed here into the rows of seating as she built them: The Lion in Winter. Under Milk Wood. The Government Inspector. Shortly before she died, Rowena built a new structure, a balcony for a production of Romeo and Juliet. It juts into the playing space – an inconvenience, obscuring the audience view of a key upstage entrance, but it’s maintained now for posterity, part of the ‘iconic’ geography of the stage. It reveals a tension present in many places of performance. Theatre, and the structures that house it, so often pull in opposite directions. A building is typically designed for posterity, intended to outlast any of the players and audiences that inhabit it. But plays are always tumbling to their own ending; the most brief and vivacious of art forms, theatre’s energy is derived from how much it is an object of the present. Rowena had a deeper grasp of the required symbiosis between these elements than most theatre architects. The notion that any part of her structure might become sacred would likely have seemed absurd to her. She was forever blowing bits up – sticking gunpowder underneath a seating box that dissatisfied her, knocking down the stage backdrop and rebuilding it – recrafting the space, rather than diminishing the play to that which contained it. ‘The theatre, for her, was like building sandcastles’, says architect Simon Crosse, and like sandcastles, its beauty was in part a function of how soon it might give way to the turn of the tide. It was evolving, animated by change. So she kept working. Do people do things like this anymore? Do they hold a single vision alight for an entire lifetime, pursue it so doggedly, to the exclusion of all else? I think of what it must have taken on those excoriating mornings, to drag yourself out of bed, bones cracking, face the whipping winds and the ice seaspray, to haul bags of sand up that sheer cliff, again and again, in pursuit of a dream that might to so many have seemed frivolous, quixotic. Geoff Dyer, writing about Rodia, contemplates the cussedness required to continue a work like this over decades, to push through the drudgery, the setbacks and the boredom. ‘Perhaps, at some point, he was so habituated to working that it didn’t occur to him to do anything else’, he writes. I’m reminded of Werner Herzog’s Fitzcarraldo. The film’s eponymous hero is an early 20th century rubber baron who drags a steamship over a hill in the Amazonian rainforest, in a misguided attempt to raise money to build an opera house in Iquitos, the remote Peruvian town where he lives (Admittedly he does this with the assistance of a large number of exploited Amazonian natives, but please permit the analogy). He never gets his opera house. But in the end, he is happy. Is the pursuit of the fantasy its own reward? ‘It’s only dreamers who ever move mountains’, says his paramour, Molly. When the Second World War came, Porthcurno, which was the site of an important cable office, was considered vulnerable to attack, and fortified accordingly. The Minack was taken over as a look out. Prisoners of war were brought on site to clear it. A gun turret went up, pillboxes were built, and a thick bank of barbed wire encircled the site. By 1945, the war had laid waste to Rowena’s theatre. Stone by stone, she rebuilt it. Perhaps, for her, there was no other option. We come back for the evening’s performance, arriving early to take in the last of the sun before the show starts. We pull into a makeshift car park in fields on the edge of the site and join the gaggle of people making their way towards the theatre, weighed down with piles of cushions, heavy stacks of blankets, picnic baskets and ice coolers. Then, emerging at the clifftop, we gaze down over the vertiginous bank of seats. In the fading daylight, the paths are illuminated with strings of bright globe lighting, and there’s a festival atmosphere, people settling into their places, creating nests with picnic blankets and cushions, sharing sweets with their neighbours and eliciting the loan of a bottle opener. Prosecco corks are popped: the heady combination of booze, glass, height and concrete is thrillingly at odds with health & safety imperatives. A teenager wanders around in a thick fleece dressing gown, a pair of binoculars on a string around his neck. There are many North Face jackets. 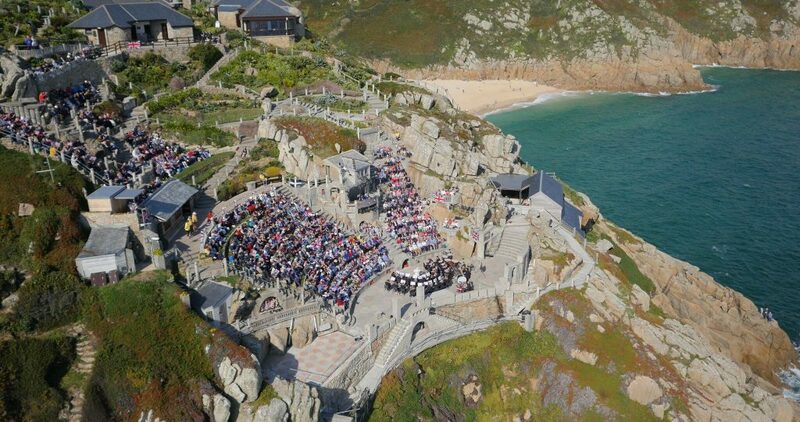 The Minack is big business now, number one on Tripadvisor for Cornish tourist attractions and a fine example of the economically generative value of theatres, if you are given to couching such things in terms that Conservative chancellors understand. Over 80,000 playgoers attend shows each year, take their seats in the steep ranks that Rowena crafted. It’s easy to mythologise what happened here. Rowena Cade was able to do what she did because she came from an affluent family; she had the personal wealth to pursue what might easily be viewed as a foible. Unlike Rodia, her labour didn’t happen at the end of a tough day’s work in the quarries, an adjunct to the irksome business of having to earn her bread and butter. This was the substance of her life, and being able to make a project like this the substance of your life is in many ways a privilege. But it took all she had. By the end of her life she was living alone with her six dogs in just one room of Minack House, cooking herself sparse meals, going without heat in the winter. She struggled to keep things going, twice inviting other organisations in to help run the theatre; the attempts failed, and it was only long after she died in 1983 that it began to thrive as a business. Still, she kept faith with her creation to the last, sustaining it with her own diminishing funds, making additions and improvements. We’ve caught the last of the day’s light. It’s cloudy, and the day is fading fast, but there’s a thin band of pale pink through the sky, and we watch it fade through mauve, aubergine, until all the sky is royal blue, and the moon is a pale plate behind scattered clouds. It’s exhilarating to watch theatre outdoors. The fact that it could totally chuck it down, that we could all end up completely soaked, but we’re all here anyway, seems to underline the pronounced sense of camaraderie you only get in theatres. It’s a small, and very British, type of heroism. Now it remains dry, the day giving way to a cool clean night. The production is The Crucible, performed by a predominantly amateur ensemble. The Minack has always been a stage for amateur groups – there are companies that have been coming here since the 60s and 70s, from all over the country. It means the quality can be variable. My friend Olly who wrote to me to suggest this theatre for the book caveated his recommendation: ‘I can’t help feel it’s a bit of a tragedy that the greatest theatrical experience I ever had there was watching some awful dross – I can’t even remember what it was’. But it’s a tradition that’s tied to those summers of the 1920s and 30s when there was so little for the communities here to do in their leisure time, so they made their own entertainment. How fine it must have been to spend the summer with friends, out in the open air, sinking into Shakespeare’s seductive, insistent poetry. How magic to greet your audience with this secret jewel of a theatre, to witness their delight as they crested the clifftop, and then, as it darkened, to bring forth Prospero, Caliban and Ariel, lit only by car headlights and the par can moon. The midnight matinees of the 1950s, the times when the rain came down in stair-rods but the cry went up from the auditorium: ‘you play, we stay’. Rowena was herself an outsider, an amateur with no formal training in architecture or theatre. She got on with it, anyway. Besides, there’s always the stage flat sky and the sea, and sometimes impromptu choruses of porpoises in the distance, bit parts for basking sharks. Olly says he ‘spent the entire time looking at the horizon. Over the course of the play a tanker moved achingly slowly from left to right. It was amazing.’ Rowena’s theatre invites not only attention to the drama of the plays, but also to the drama of nature: a reminder that it is its own spectacle, worthy of our stillness and contemplation. Tonight, the enormity of the backdrop lends itself to Miller’s tale of sorcery and the supernatural. The Atlantic is a great wide plain that stretches over 3000 miles, uninterrupted from here to Salem, Massachusetts. As the night deepens, the actors light a great fire pit at the centre of the stage: it flames against the stark black sky. It’s impossible not to be bewitched by it. There’s a photo that I have pinned above my desk. A wheelbarrow is rusting, spotted whitely where the seasalt has got to it. It has been upended; it forms an impromptu chair. In it, Rowena Cade is sitting reading a book, her concentration undivided as her shock of white hair blusters about her, crazed by the weather. Her skin is tanned, deeply marked with wrinkles. She wears black leggings, grey knee high socks trimmed with burgundy, black slippers and a thick Argyll knit that shrinks her tiny frame even further. Behind her, granite boulders rise in a bank, out of shot. She looks entirely at ease, lost in her own world. What are you reading, Rowena Cade? I’d like to be able to climb into the frame, to gaze over her shoulder. But the words are forever lost now, unknowable. No matter. The picture speaks of action. In a moment she must spring to her feet, seize up her tools and continue her work: to build a place where words and ideas become manifest. Taking time to find a chair to sit in would be a waste. A wheelbarrow does just fine. That was Rowena. All propulsion, forward trajectory, a restless creature in constant pursuit of her wonderful, confounding dream: a symphony in stone. She built it because it wasn’t there. Twenty Theatres to See Before You Die by Amber Massie-Blomfield is published by Penned in the Margins. 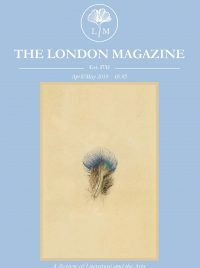 To discover more content exclusive to our print and app editions, subscribe here to receive 6 journals a year from The London Magazine, as well as full access to our extensive digital archive.